The T-80 is a Soviet tier 4 light tank. Desarrollado en el verano y otoño de 1942 en el Departamento de Construcción de la Planta de Automóviles de Gorki bajo la supervisión de N. A. Astrov. El vehículo entró en servicio en diciembre de 1942. Se fabricaron en masa un total de 85 vehículos. Built at the Kirov factory starting from March 1942, the T-80 is a modified version of the T-70 light reconnaissance tank, with the old 1-man turret replaced with a larger 2-man turret to improve combat effectiveness. The T-70 and T-80 replaced the T-60, which was originally intended as a replacement for the aging PT-38 amphibious scout tank and the sophisticated but expensive and complex T-50. The T-70 and T-80 addressed the main issue of the T-60 which had poor cross-country mobility and a weak 20mm main gun. All light tank production was stopped in October 1943 after only 180 T-80s being built, since the Red Army tactics no longer included the use of light tanks. The T-70 and T-80 chassis was used as a basis for the SU-76 and SU-85B tank destroyers which were used throughout the war. The T-80 leads to the T-34. The T-80 at first may seem like a pretty bad tank with its low speed and mediocre guns. However, the gun fires very quickly, and is capable of using that rate of fire at greater ranges thanks to its good aim time. 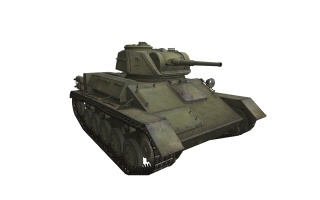 It is a rather small light tank, so not only does it have good camo, it keeps that camo when moving too. However, this does not mean you should try scout in it like you would in the A-20 or other similar tanks. The 45 km/h speed limit and below-average acceleration make this a bad idea. What this tank excels at is a sniping or supporting role. The T-80 can provide constant and accurate firepower from respectable ranges. If someone decides to ignore the 55 damage shots hitting them every 2 seconds, they will soon regret letting you chew through their tank. It also has enough speed to follow the push. Remember, it is only slow compared to other light tanks. The 45 mm VT-42 gun carries over from the T-70. Install it immediately to improve your fire power. Next, research the T-80 reinforced chassis. It will improve the manoeuvrability and is necessary to install the better engine. Research the GMC 6004 engine to improve its dynamics. Next, research the 9RM radio to be a more effective scout. 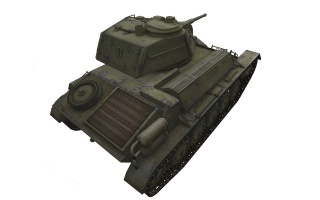 Finally research the better version of your gun, the 45 mm VT-43, with improved accuracy and rate of fire. 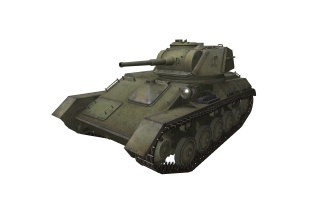 The T-70 was a light tank used by the Red Army during World War II, replacing both the T-60 scout tank for reconnaissance and the T-50 light infantry tank for infantry support. The T-80 light tank was a more advanced version of the T-70 with a two-man turret—it was only produced in very small numbers when light tank production was abandoned. The T-70 was armed with a 45-mm L/46 gun Model 38 with forty-five rounds carried, and a coaxial 7.62-mm DT machine gun. The tank was operated by a driver and a commander who loaded and fired the gun. Armour thickness on the turret front was 60 mm, hull front and sides: 45 mm, rear and turret sides: 35 mm, roof and bottom: 10 mm. By 1942, light tanks were considered inadequate by the Red Army, unable to keep up with the T-34 medium tank and unable to penetrate the armour of most German tanks, but they could be produced by small factories which were unable to handle the large components of medium and heavy tanks. 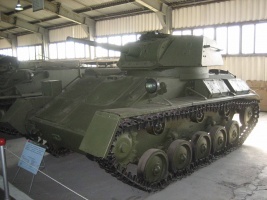 The T-70 was an attempt to remedy some of the shortcomings of the T-60 scout tank, which had very poor cross-country mobility, thin armour, and an inadequate 20-mm gun. It also replaced the very short production run of the T-50 light infantry tank, which was more sophisticated, but also much too complicated and expensive to produce. The T-70 was designed by Nicholas Astrov's design team at Factory No. 38 in Kirov. The first batch of T-70s were built with a GAZ-202 automotive engine on each side of the hull, one driving each track. This arrangement was seen to be a serious problem, even before the first tanks were issued. 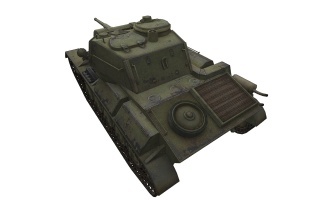 It was quickly redesigned as the T-70M (although it continued to be referred to as just T-70), with the engines in-line on the right side of the tank and a normal transmission and differential. The conical turret was replaced by one more easily welded out of plate armour, and moved to the left side of the hull. Curiously, even after the T-70's production line was redesigned, SU-76 self-propelled guns started to be built with the same unsatisfactory unsynchronized two-engine layout, and all of them were later recalled for factory rebuilding as SU-76Ms. T-70s were put into production in March 1942 at Zavod No. 37, and along with T-60 production at GAZ and Zavod No. 38. They completely replaced T-60 production in September 1942, although that tank remained in use until the end of the war. Production ended in October 1943, with 8,226 vehicles completed. In April 1942, the conical turrets on early-production machines were replaced with new welded turrets. The end of the T-70's production run was built with two 85-hp GAZ-203 engines, a Mark 4 commander's periscope replacing a vision slit, and other improvements.The T-70 remained in service until 1948. The one-man turret of the Soviet light tanks made co-ordinating a tank platoon nearly impossible, because the commanders were kept busy acquiring targets, loading and firing the main gun and machine gun, and commanding their drivers. The infantry tank role was already considered obsolete. The SU-76 self-propelled gun was better suited for infantry support, its 76.2-mm gun capable of firing a larger high explosive shell. Industrial resources could be redirected from light tanks to building SU-76s. In an attempt to compensate, the T-80 light tank was designed, a more robust version of the T-70 with a two-man turret. But there was enough lend-lease equipment available to fulfill the reconnaissance role of the light tanks, and armoured cars were better suited for light scouting and liaison. All light tank production was cancelled in October 1943, after only about 120 T-80s were built. No further light tanks would be built during the war. In November 1943 Red Army tank units were reorganized: light tanks were replaced by the T-34 and new T-34-85, which started production the following month. Light tanks continued to be used in self-propelled artillery and some other units. The Soviets did start development work on an amphibious light tank in 1945, resulting in the post-war PT-76, introduced in 1954. T-80 Light Tank Photos & history.